The property world’s focus on diversity and inclusivity has sharpened throughout this year, as events like the Presidents Club dinner demonstrate a persistent gap to achieving a truly representative industry. 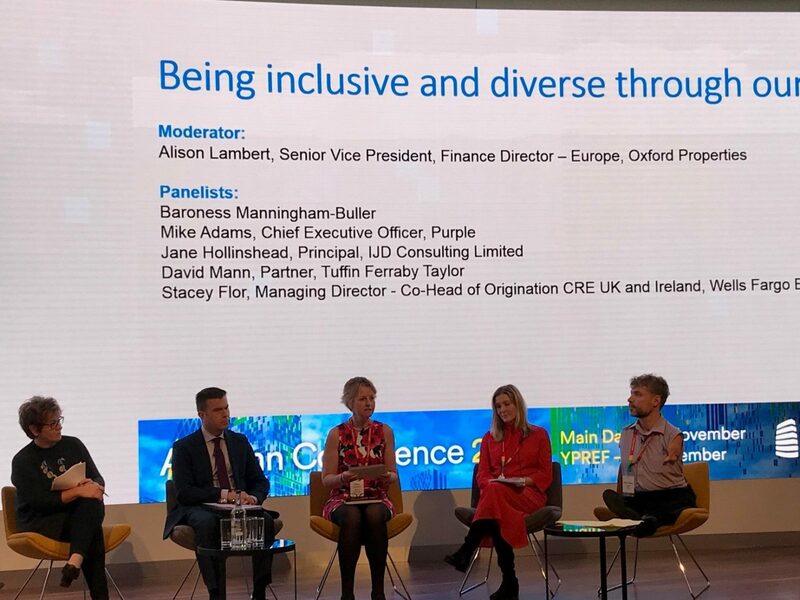 This week’s CREFC Europe Autumn conference was based on this theme, examining the role for inclusive and diverse environments to propel our industry forward. A series of panels addressed the perspective of individuals, real estate businesses, investment strategy and the broader housing market too. Our very own David Mann joined a panel – ‘Being Inclusive and Diverse Through Our People’ – along with representatives from disability charity Purple, IJD Consulting, Wells Fargo and the Wellcome Trust. Together, the panellists discussed how best to balance the industry for gender, disability, and how to draw on a wider base of new talent. While discussion of pay is important, diversity is fundamentally limited by the range of people who see the potential of a career in property, let alone to progress in it. The industry risks becoming a victim of tradition if leaders continue to hire only those who look and sound like them. A major consequence of this pattern is what Eliza Manningham-Buller described as the gender role gap. Yet, we know a more diverse team is more likely to be adaptable and capable to solve a greater range of problems than those cut from the same cloth. But how do we break out of the blueprint? Hiring for diversity is the first part of the puzzle; cultivating an inclusive environment is the next part of ensuring different people can bring their expertise to bear in the best ways. As different people find their roles in new teams, it’s easy to fall back on old practices, processes, policies and attitudes which could be exclusive to new talent. Empowering everyone to make their needs understood will help shape initiatives or more subtle cultural changes which pave the way for acceptance and inclusivity to be part of the fabric of a business. One of the greatest catalysts for change are our clients, who understand the inherent advantages of a diverse and therefore representative business. In turn, they expect their supply chain to embrace the same principles. Therefore, the case for diversity isn’t just about owing opportunity to the diverse array of brilliant people out there. It’s also, simply, good business – sustainable growth and delivering great work relies on finding and retaining talented people from all kinds of backgrounds.